away from Sandton's business and shopping districts. inutes away from Sandton City, and even less from Fourways Mall, lies an unexpectedly beautiful recreation of an 18th century Cape Dutch homestead in an “island” of green tranquility, even in winter. Set in 3 acres of countryside, and lovingly filled with treasured family heirlooms and magnificent antiques, it is a place of peace and pampering. 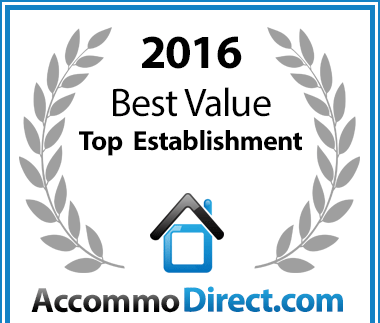 De Kuilen Country House has been voted a Best Value for money Sandton establishment. 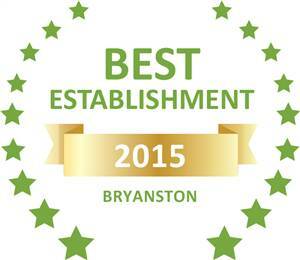 Based on reviews of establishments, De Kuilen Country House has been voted Best Establishment in Bryanston for 2015.
about days at de Kuilen. de Kuilen combines the warmth and graciousness of traditional Cape Dutch hospitality with all modern comforts in one of Johannesburg’s most convenient northern suburbs – perfectly positioned for a peaceful setting and a spacious venue for relaxation. Guests may choose from our large and charmingly appointed cottages: Birdsong Cottage, Pomegranate Cottage, and Arum Lily Cottage - all self-contained and tranquil, set in their own gardens, fragrant with roses and herbs. You may also choose to have breakfast served on your own private garden verandah, or in the rose-filled courtyard of the main house. For other meals you may wish to take advantage of the excellent self-catering facilities. Perhaps indulge yourself with a memorable gourmet dinner, provencal in feeling, preceded by conversation by the fire in Winter, and in Summer, drinks in an alfresco ambience. Have a refreshing swim in our immaculate pool surrounded by beautiful gardens. All our rooms are air conditioned to provide refreshment after a day in the summer sun. "A visit to De Kuilen is sensually intoxicating, the ideal accommodation for the vacationer seeking a blend of both bucolic and urban worlds. It is equally suitable for the business traveller who seeks a quiet refuge from the stresses of a hectic schedule at the end of the work day. " An Evocation of 18th Century Cape Dutch elegance and hospitality. All cottages accommodate two guests but some can be made inter-leading. All have private entrances and offer you a holiday you will remember for the beauty of your surroundings and the calm, courteous, caring hospitality. All the food served is sourced from local food markets. In winter our warm and cosy fireplaces are fully stocked with our own sustainable wood supply. 14 solar panels provide the venue with continuous power and helps us to contribute to our eco-friendly ethos. This has truly been my favourite place to stay at in Jhb. Amazing environment - real old world charm. Fantastic breakfast and the hosts organised an exquisite lunch in the garden. I left here feeling truly refreshed and looked after. I would recommend it both for business executives who want a place of serenity after a busy day and for couples just needing a place to breathe. Exceeded all my expectations. What a find! Whether you are looking for a weekend of unrivalled golf, playing some of the finest locations in South Africa or simply the experience of a South African course, de Kuilen is perfectly located to get to a variety of the best clubs all within half an hour's drive. The Bryanston Country Club, Dainfern Golf Club and The Johannesburg Country Club are 3 of the 5-star courses just around the corner from de Kuilen. We will happily book your tee-off time and arrange transport there and back on your behalf. If you have not played in Johannesburg before, you will be amazed at the quality of the courses and the value for money. We can book a day or a week's worth of golf for you, and pay deposits where required! We offer our exquisite venue for small, special conferences - roaring log fires in every room in winter, gourmet food prepared by a French-trained chef, a wonderful escape within 20 minutes of Sandton City. The 3-acre garden is filled with the sound of birds and splashing fountains, scented by 1000 red roses and immaculate green lawns, with charming traditional architecture and 6 luxury suites at this 5 star graded Guest house, on the edge of Sandton in Fourways. We didn’t anticipate, but found through the unique touches offered by your gracious hosting, a place of exceptional attention to detail and refinement; so much so that quite a few of us stayed on after the conference and have subsequently wanted to book your venue for other functions. All at Morgan Paull had a fabulous stay and would like to thank you once again for hosting our 2005 Conference. At de Kuilen you will discover some beautiful, authentic African art on display - beautiful pieces for your appreciation, collected over the years from different regions in Africa. We have a collection of reference books, photographic journals and artworks available for our guests to peruse and enjoy. Shopping tours can be arranged, with advice and info on the best places to acquire some of your own authentic African art. The highlight of any stay at de Kuilen must be the four-course gourmet dinner. CHILDREN ARE WELCOME in all the cottages and inter-leading cottages, where your own private dining table is available. We cater for children of all ages at a reduced rate up to 9 years old. ON-SITE: BEAUTICIAN trained in slimming treatments, facials, aromatherapy and massage: in your suite by appointment. Swimming pool and Jacuzzi. Immaculate swimming pool: "Beat the heat" in our beautiful pool and cool down with a chilled cocktail. Air conditioning in all suites. NEARBY: Malls and shopping centers, award winning restaurants, fitness center with indoor pool, golf courses and driving ranges, horse riding, and complimentary gym passes. Small conferences: our establishment is the perfect venue for your small conference or meeting - only 20 minutes from Sandton, but with a far-from-it-all atmosphere. Satellite TV, video/C.D. player, digital bedroom safe, hairdryer, fluffy white towelling gowns and slippers - no disturbances. Kettle, hospitality tray, coffee machine, microwave available for each suite. ‘Starter’ provisions (on request), selection of teas and coffees, and Belgian chocolates. There is a mini-bar fridge in each suite, fresh fruit and flowers in abundance. Self-catering: Arum Lily and Birdsong Cottages have full kitchens if required. Free Wi-Fi access in all suites. Car and shoe cleaning. Dry Cleaning drop-off and collect. Safe covered parking on the property with excellent security. Airport transfers and car hire arranged. Reductions made for long stays where possible. On parle francais ici. Some of us also speak German.